Does a dog have a personality or is it a canine-ality? Anyway, last year at this time we were mourning the passing of our dog Chia. She had a wonderful personality, actually she pretty much thought she was a person. We had the impression that she thought she was above associating with our cats or even other dogs. She preferred our company and usually tried to figure out what we wanted and do it. Last June we brought home another standard poodle puppy, Cora. We wanted a white small standard and were fortunate to be able to find a runt of a littler of 10 pups. The breeder thought she would probably be small but no guarantees. We decided on a white dog this time to make it easier to spot ticks. We have lots of ticks here. Chia had been infected with tick born diseases more than once, even though we treated her with tick preventatives. So it turns out that color is not the only difference from Chia. Cora is very high energy and much more playful. At first we keep thinking getting her was a huge mistake. She is so much more affectionate with us than Chia was and eventually she won us over. She thinks she is a lap dog, which was our first mistake. Not that we mind sharing our lap with her but it reenforced the idea that she could do anything she wanted. She is coming along in many areas, but still has a strong desire to play using her mouth and her paws. She has finally learned that it is not ok to chase the chickens and guinea hens. She still chases the barn cats, but thats ok, they chase her too and they seem to love wrestling together. I grew up with dogs and I always thought I knew how to train them, but Cora was not responding to my soft approach. Dean and I ( especially Dean) had to learn that we need to teach her she is a dog and we are in charge. I could see she had a presumptuous attitude. She thought anything she wanted to do was good. After Cora scratched a grandchild’s face by being overly playful we decided we needed to take her training much more seriously. While we still allow her to be a lap dog, it is only when we invite her. We had to learn that we needed to be her leader which means we needed to be tougher. We had to learn to balance affection with discipline, so Cora would learn our rules and consequences. Once we started implementing rules and consequences we saw an immediate change in her attitude. 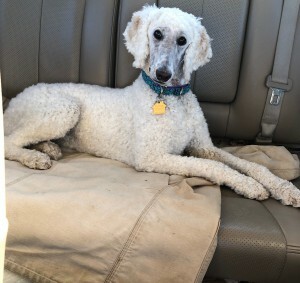 We never thought we would get a standard poodle that didn’t have a compliant easy to train personality. The good news is we realized she needed more structure and training and she is becoming the a really good dog. Posted by Maryclaire Mayes on Friday, March 29th, 2019 at 04:41 and is filed under General.